Retiring Americans are increasingly socially disconnected as compared to their predecessors, new research from Sen. Mike Lee's Social Capital Project (SCP) shows, a phenomenon that will pose severe challenges for policymakers and the public alike in coming years. One of the most important social trends in America today is the aging of the Baby Boom generation into retirement. The largest birth cohort of the last century, the Boomers' transition into their golden years has profound implications for work and welfare. The group's departure from the workforce substantially alters the mix of skills and the number of workers in the economy. And with old age comes dependence, as the end of a steady income and declining health compel more and more Boomers to depend on others for aid. That dependence has historically meant relying on peers—family, friends, fellow seniors, and members of extended communities. These kinds of connections—social capital—were once a vital part of American life, providing a broad base of support for elderly Americans in general. Are those relationships as strong as they once were? To answer the question, researchers at the SCP looked at data from the nationally representative Health and Retirement Study, administered every two years by the University of Michigan. Specifically, the SCP examined the number of 61- to 63-year-old respondents who affirmatively answered a number of questions measuring social connections. This gave them a moving view of those born between 1931 and 1933 to those born 20 years later, in the Baby Boom. The results are startling. Between 1994 and 2014, the percentage of adults married or cohabiting fell, as did the percentage with: a "good friend" in the neighborhood; a child within ten miles; who attend church at least three times per month; and who have a relative in the neighborhood. The Boomers have more living siblings than the Silent Generation, but fewer children, thanks largely to declining fertility rates. The sizes of the changes are pronounced, too. In 1994, two thirds of retirement-age adults lived within ten miles of their children; by 2014, that figure had fallen to 55 percent. The number with a relative in the neighborhood fell 12 percentage points, and with a good friend in the neighborhood by ten percentage points. In 1994 retirees had an average of 3.1 children, compared to 2.1 by 2014. What this means concretely is that older Americans have fewer connections—to family, to neighborhood, and to church—than they used to. That, in turn, means that they will be less able to call on those relationships for the medical, emotional, and financial support and interdependence that all elderly people require. This increasing loneliness and isolation among aging Boomers has real implications for their health. 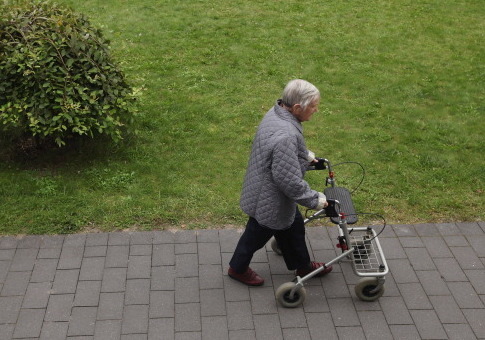 A recent Wall Street Journal investigation noted that loneliness among the elderly is more strongly associated with mortality than obesity or physical inactivity, meaning that the rising tide of disconnected senior citizens are at greater risk of disease and early death. But the implications are broader than the individual level. The rising tide of disconnected, older Americans will likely force changes in who is responsible for elder care. As social capital resources are taxed past breaking, the burden of care will fall more and more on the individual, and where he can't take the burden, the government. "Informal" care from friends and family can be, and increasingly is, replaced with formal care from a registered nurse or home health aide. The Bureau of Labor Statistics projects that the number of home health and personal care aides will grow by a whopping 1.2 million jobs between 2016 and 2026. That accounts for a 41 percent increase compared to just 7 percent across all industries in the same time. Commercially provided care comes with a hefty price tag, however. The Centers for Medicare and Medicaid Services estimated that in 2017, Americans spent $166 billion on medical care in retirement facilities, and $97 billion on home health care; both figures increased 2 to 4 percent over 2016. A 2011 survey, cited by NPR, found that annual home health care costs can run to $20,000, while residency at a nursing home can eclipse $90,000. All of this money has to come from somewhere. Figures from 2012 indicate that total home health-care spending is about 15 percent from private insurance or out-of-pocket. That figure is pre-Obamacare, so is likely lower now, but it still implies that some aging Boomers will pay for home healthcare from their own savings. However, many will not, as Boomers face aging into retirement with inadequate savings. The resultant burden will fall, inevitably, on the taxpayer. Baby Boomers are projected to double Medicare and Medicaid costs by 2020 alone, and the AARP has estimated that socially isolated seniors cost Medicare an additional $6.7 billion per year. What is more, these trends are unlikely to abate for Boomers' successors among the Gen X and Millennial sets. Declining marriage, fertility rates, and religious attendance mean that as these groups age into retirement, they will also have fewer family members to depend on—including a cascading effect, as fewer children for one generation means fewer siblings and cousins for the next. In other words, the decline of social capital almost necessarily means greater dependence on professional health aides and government assistance, for current and future retirees both. Such services, while they have their benefits, are at best an imperfect substitute for human relationships, making the challenges of aging America social as well as financial. "By anticipating these potential costs, we can prepare for and reduce them," the SCP report concludes. "Policymakers, health care providers, and institutions of civil society should think creatively about how to mitigate the looming challenge—starting now." Still, the SCP's reporters outlook is less than sunny. "Unfortunately, in an age of declining social capital, our collective quiver will be short of arrows as we search for ways to address these questions," they conclude. This entry was posted in Issues and tagged Health Care. Bookmark the permalink.